November 19-20, 2014 in Sunnyvale, California to be part of the movement to IPv6 & the Internet of Things. 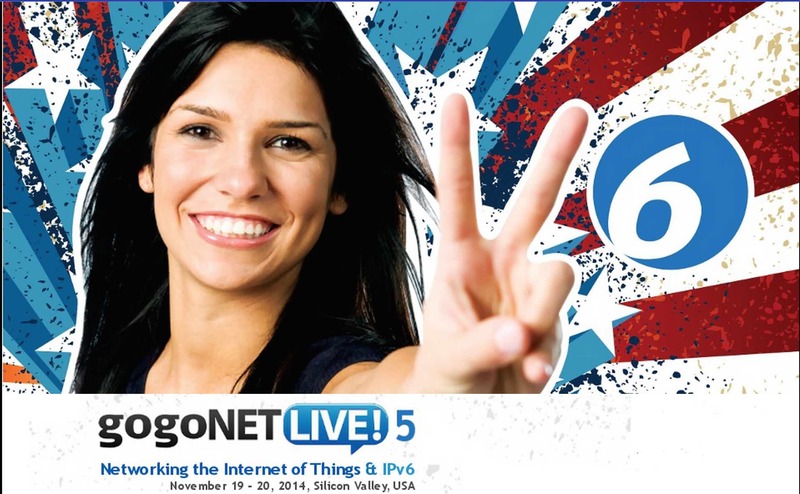 The California IPv6 Task Force together with GogoNET Live! hosts our fifth annual IPv6 focused conference in the Bay Area. The conference revolves around networking for IPv6, the Internet of Things and sensory networking and how the three are intrinsically related. With a new “invite only” venue format for CAv6TF members, learn how organizations IPv6-enable their web services, how to advocate IPv6 in your organization, and how IPv6 business drivers are pushing the envelope for IPv6 adoption. Whether you want to use IPv6 to connect people or things come join us to learn state of the art networking technology from the experts leading the way. Virtual passes are also available! ** Alert: the website has been updated with the newest agenda and the event looks to be great so register at http://gogonetlive.com – There is also the virtual attendance option – watch live via video stream via the Internet. Find out more at http://gogonetlive.com and get involved in developing next year’s conference agenda. This entry was posted in CAv6TF, gogoNET, IPv6, Task Force. Bookmark the permalink.